Gold when priced in USD’s closed on Friday at a nominal $1,388.30. Convert that into GBP’s and you’re looking at a Nominal Gold Price of £912.53. Staying in Sterling that is a Nominal Gold month on month price fall of 5.9% and a year on year price fall of 8.4%. 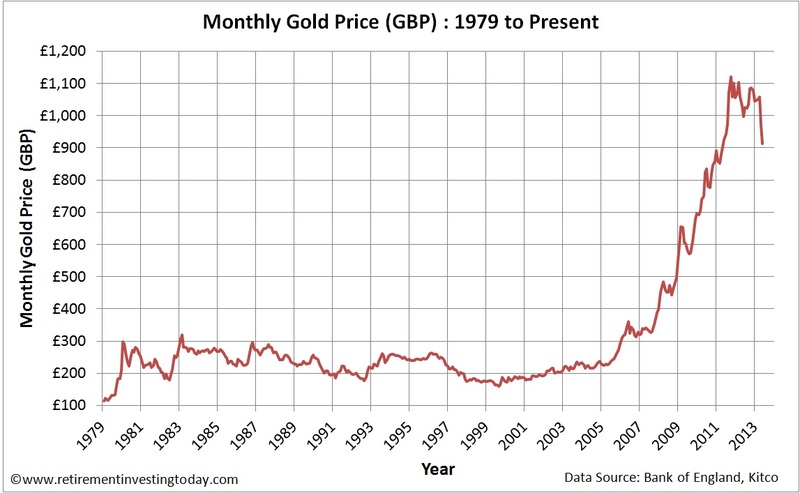 The chart below shows the Nominal Monthly Gold Price in £’s since 1979. 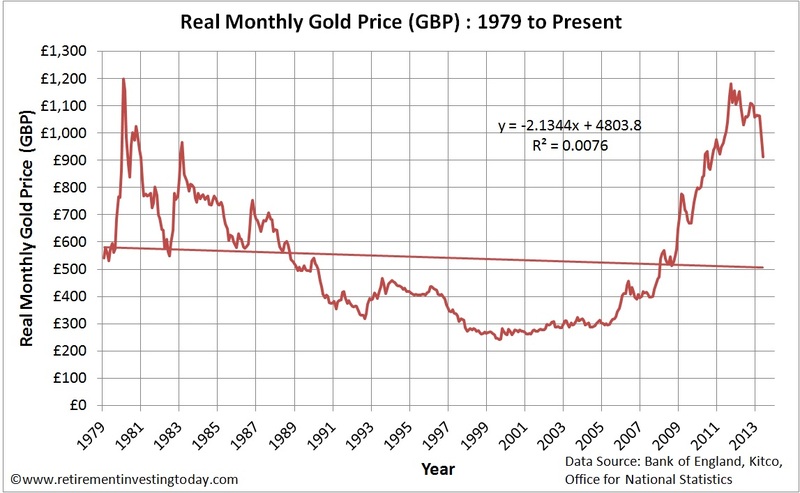 Real Gold Peak Price was £1,199.2 in January 1980. At £912.53 we are 23.9% below that peak today. The long run average is £542.96 which is therefore still indicating a very large potential overvaluation. The trendline indicates the Real Gold Price should today be £506.36 which would indicate even further overvaluation. I aim to hold Gold within my own Low Charge Portfolio. This isn't because I wear a tin foil hat or think that the world is about to go all Mad Max. It’s because I want to hold commodities within my portfolio as they have a different correlation with my other asset classes and Gold (unlike many commodities for investors) if bought correctly is one commodity that won’t suffer from contango or backwardation. I want my asset classes to have different correlations so that hopefully as some are rising in value others are falling in value. I can then be selling those that are rising and buying those that are falling. The perfect scenario would be 2 assets that have a negative correlation with the Holy Grail being a correlation of -1.0, however unfortunately they don’t seem to exist. If I look at Gold vs say the FTSE100 since 1993 we find a correlation closer to 0.26 which while not negative is still considered to be a weak or low correlation. 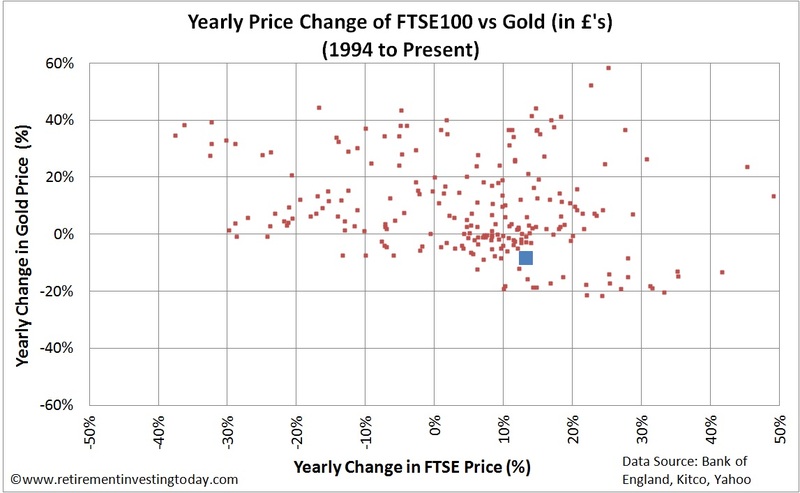 To visualise this a little differently the chart below shows a comparison of the yearly price change of the FTSE100 (UK Equities) compared to Gold when both are priced in £’s. On this chart you can see a data point coloured blue. This represents today where we find gold down 8.4% and the FTSE100 up 13.3% year on year. My investment strategy requires me to rebalance an asset class whenever it moves away from my target allocation by 25%. The downwards move in Gold, the upwards move in my Equities generally plus large injections of new money meant I was forced to rebalance my Gold holding this week by buying more gold. So even though the data above suggests Gold might still be overvalued my mechanical strategy forces a buy. Will I be right or wrong? I have no idea as I've proven that I am rubbish at predicting market moves but that I am becoming a good investor and so only time will tell. Last gold and FTSE 100 price actual taken 31 May 2013. All other prices are month averages taken from the Bank of England and Yahoo. May 2013 inflation is extrapolated from the Retail Prices Index (RPI). I respect your methodology -it's interesting and rigorous, but I have to say I prefer to listen to what the regression line is telling me. The long game I'm playing is to try and if possible beat (but at least match) a benchmark set in 2007. I expect along the way to early retirement my strategy will make some good but also some bad decisions. Since 2007 I've been meeting my target with the benchmark returning a CAGR of 4.6% while my mechanical strategy has achieved 7.6%. Maybe I'll lose on this one but then again maybe I won't. I just don't know and that's why I'm mechanical and non-emotional. For me it doesn't matter as long as overall the strategy works I'm happy. "The perfect scenario would be 2 assets that have a negative correlation with the Holy Grail being a correlation of -1.0, however unfortunately they don’t seem to exist"
It isn't a Holy Grail though as the expected return would be zero with a sd of zero. Assume you have two assets with a value of 100, if they are exactly negatively correlated then if one increased to 105 the other would fall to 95. If you held both equally there would be a net gain of zero(and probably some costs). Not true assuming you have an asset which also generates interest. If you had to gold like commodities with a -1.0 correlation you would be correct. Say there are two perpetual bonds with a 10% yield. Year one they both trade at 100. Year two A is up 10 to a 110. -1.0 correlation so naturally B is down to 90 and so you rebalance but you've also collected your 10% interest payment. As Anonymous 2 says most asset classes will give some sort of yield (in my portfolio only gold is the exception) however don't forget the regular rebalancing capital gain benefit of buying low and selling high. From the current situation I'm struggling to think how they will ever be able to stop QE let alone wind it down. The UK National Debt is about £1.1 billion. So far the Bank of England has bought £375 billion, or about 34%, of this debt through Quantitative Easing (QE). This has given us the low bond rates we see today. From here I can only see 2 long term scenarios. 1. If the BofE doesn’t continue to QE then the main buyer leaves the market which should result in rising rates, controlled inflation (possibly even deflation) and subsequent asset price deflation. This will bankrupt many and I believe will be avoided at all costs. 2. If the BofE then continues to buy then at some point the markets must realise that the level of QE is so large that the debt can never be sold back to the market leaving the BofE with no choice but to monetise the debt which will devalue the currency, result in large levels of bond selling, rising rates, uncontrolled inflation and still subsequent asset price deflation. Either way the UK Economy eventually sees the pain that it should have had a few years ago which would have been a very bad recession including the writing off of bad debts and asset price deflation. We would however have been growing again by now instead of the flat line economy we see today plus lining up for a possible depression. Given the government/BofE are going for the Financial Repression option they'll end up with the inflation route. If the two assets pay a dividend or interest payment then they will not have a completely negative correlation though. I would not separate out income vs capital gain as total returns count. The split of income versus capital gain, is excluding tax and costs, irrelevant. 1. I buy 10 widgets at £1 and 10 thingys at £1 for a total value of £20. 2. Widgets go to £1.25 and thingys go to £0.75 so I still have a total value of £20. 3. I rebalance to 8 widgets and 13.3 thingys for a total value of still £20. 4. Widgets and thingys go back to their £1 for a total value of £21.33. The 2 assets have moved with a correlation of -1 and also effectively gone nowhere yet I'm up 6.7% through doing nothing more than rebalancing. I understand your approach of systematically rebalancing asset classes, but this one makes me uneasy. Basically, you are saying that you have been making too much money in equities so will balance that by courting a loss in gold. I'm being provocative, of course, and I avoid gold myself as the market is murky, beset by ancient beliefs, and not geared to any fundamental value for this metal. But I would also be wary of "rebalancing" into bonds at the present time. Excellent website btw, with lots of good principles I support entirely on saving and investing. Thanks for sharing all your impressive data analysis.